WARSAW — Several Eastern European countries are bolstering cooperative military training in response to Russia's military intervention in Ukraine and annexation of the Crimean peninsula. The Baltic states, where fears of Moscow's military expansionism are rapidly rising, are leading these efforts. "Many countries in Eastern Europe are currently shifting their focus to military spending," said professor Marek Jablonowski, a political scientist from the University of Warsaw. "Joint military training, proposals to jointly purchase arms, these and other fields of military cooperation are likely to be developed by local governments … in the upcoming years." In Lithuania, the country's parliament recently approved an the agreement to set up a joint military brigade with by the governments of Poland and Ukraine, and Lithuania to set up a joint military brigade, the LITPOLUKRBRIG, which will is to be mainly be tasked with training activities. The unanimous vote of the 73 members of parliament who which were present at the parliament's session March 26 session paved the way for establishing the trilateral brigade, which is to be based in Lublin, southeast in Poland, 's south-eastern part, in close proximity to its the country's border with Ukraine and Belarus. 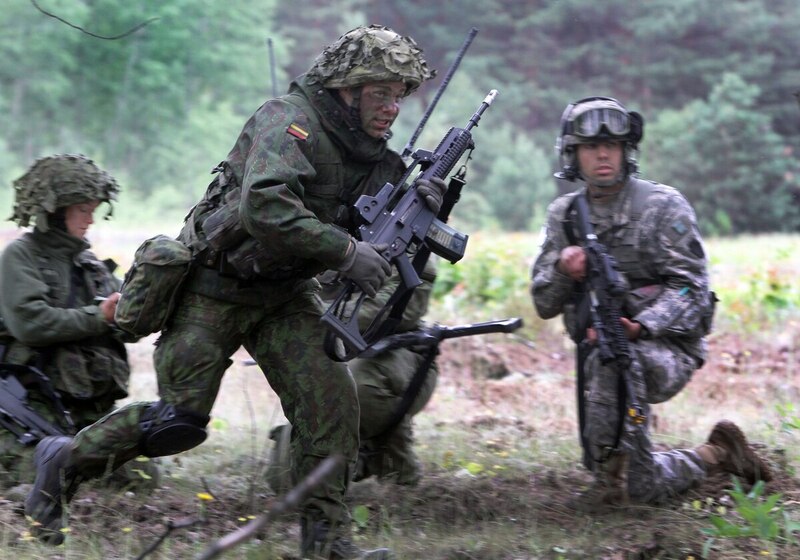 In addition to Lithuania, Other Baltic states are also intensifying their military training. activities. Estonia recently unveiled plans to host the largest drills since the country gained independence in 1991. This May, a total of 13,000 troops from Estonia and the US will are to take part in the exercise, drills, codenamed Siil 2015 (Hedgehog 2015), and scheduled for May 4- to 15. As part of the planned exercise, in late March the US Army deployed 150 troops and M1A2 Abrams tanks to the military base in Tapa, in northern Estonia, 's northern part, the General Staff of the Estonian Defense Forces said in a statement. Meanwhile, to improve with the aim of enhancing the living conditions for allied troops, Tallinn is also allocating additional funds to upgrade its training facilities. "The Estonian government has adopted a decision to appropriate €40 million [US $42.4 million] euros over the next five years to improve allied units' living and training conditions," said Mikk Marran, the permanent secretary of the Estonian Ministry of Defense. "At the same time, attention should be paid to ensuring the allied presence in the region is constant, as this is [required by] the changed security environment." The Along with Latvia, the three Baltic states are also collaborating on joint military activities through their trilateral battalion, the BALTBAT. On April 7, the military unit launched the Gungnir drills, the first joint training activity that included with the participation of all the sections of the BALTBAT. The battalion consists of combat companies, anti-tank platoons, mortar platoons and other troop units from Lithuania, Latvia and Estonia. The drills were launched April 7 in Adazi, a municipality in central Latvia's central part located in close proximity to of the country's Baltic Sea shore. Meanwhile, in Ukraine, where pro-government forces are combating Moscow-backed rebels in the country's eastern part, the government in Kiev seeks is aiming to enhance its military ties with NATO through joint training. activities. This month, 290 US troops will train Ukrainian soldiers under a recently signed agreement. Moreover, Ukraine's neighbor, Poland, which has supported Kiev in its fight combat against the rebel forces, in the country's east, has also agreed to provide military training to Ukrainian troops. Local analysts said that Russia's increasingly aggressive policy in Eastern Europe is the primary driver of the growing main reason behind increased military cooperation among by the Baltic states. The rising Fear of an intervention by Moscow has pushed some local statesmen to advocate merging the countries' armed forces. and take their cooperation to a next level. In 2013, Latvian President Andris Berzins told local news agency BNS that Lithuania, Latvia and Estonia could one day unite their militaries. While the proposal has was not been endorsed, by Riga and Tallinn, it provided additional stimulus to the ongoing efforts to combine the capabilities of the three respective armed forces. In addition to greater increased military training cooperation, The Baltic states also are also working toward expanding their troop numbers. This March, Lithuania decided to reinstate conscription for at least five years, with between 3,000 and 3,500 men expected to be drafted each year. Estonia and Latvia have maintained conscription, and their respective governments say they are planning to boost the military numbers.